Home / Opinion / Social Media Strategist' Educated Recommendation: "Move to a Blockchain Electoral System!" Social Media Strategist' Educated Recommendation: "Move to a Blockchain Electoral System!" Much has been said about the ongoing Senate hearing on electoral fraud in the nation, and the argument has raged hot and cold, relying upon the revelations and evidences presented by different witnesses who claim that there was really an election anomaly happened last 2016. A lot of people have heard and listened to countless debates, one of which is whether Commission on Elections (Comelec) continues its business deals with a suspect entity such as Smartmatic or just return to manual elections with just the proper safeguards. Various reactions have surfaced from opposing parties. 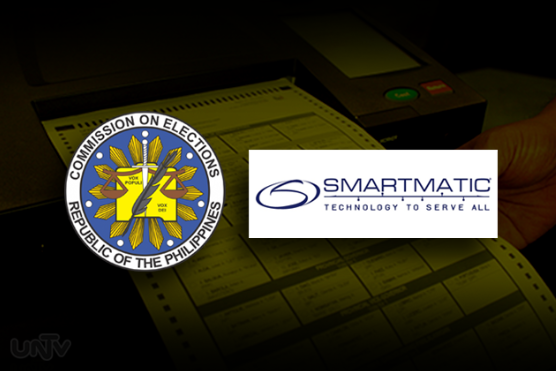 Some says that Smartmatic’s PCOS system is necessary since electronic voting and electronic counting means that people can get official election results faster and helps reduce human error, while some says that Smartmatic, logically, should no longer be an option since the company has a bad record all over the world and reportedly messed up elections with different countries already. 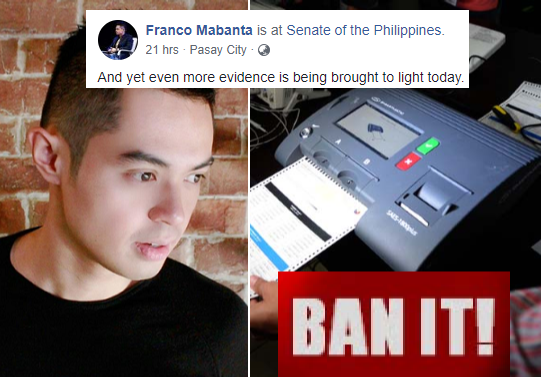 One of the most succinct explanation of why the country needs to get rid of Smartmatic and just move to another electoral system, is no other than social media strategist and political analyst, Franco Mabanta. 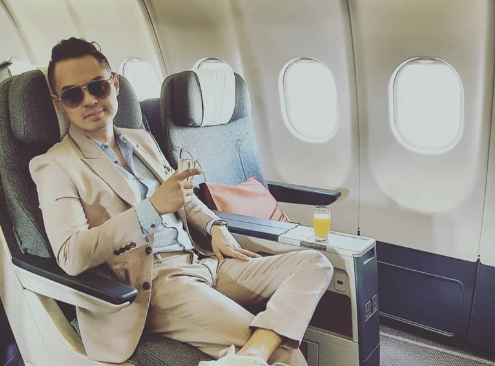 On his latest Facebook post, Mabanta talked about the Senate hearing that happened yesterday, Aug. 6, 2018, and said that additional evidences were just uncovered. He then stressed the importance of election awareness for people to fully understand their right as a voter and to safeguard their votes from the vindictiveness of fraudsters. 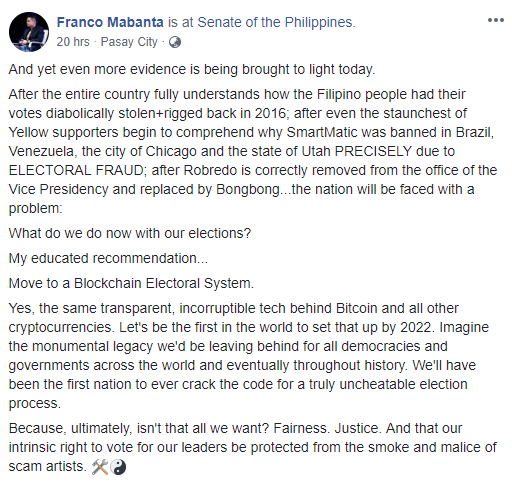 Likewise, Mabanta drives a powerful recommendation to either shift to a "Blockchain Electoral System", an incorruptible tech behind Bitcoin and all other cryptocurrencies, and be the first country to ever figure out the code for a really uncheatable election process. "And yet even more evidence is being brought to light today. What do we do now with our elections? Move to a Blockchain Electoral System. Yes, the same transparent, incorruptible tech behind Bitcoin and all other cryptocurrencies. Let's be the first in the world to set that up by 2022. Imagine the monumental legacy we'd be leaving behind for all democracies and governments across the world and eventually throughout history. We'll have been the first nation to ever crack the code for a truly uncheatable election process. Because, ultimately, isn't that all we want? Fairness. Justice. And that our intrinsic right to vote for our leaders be protected from the smoke and malice of scam artists."